Although school has started in most parts of the country, summer isn’t officially over just yet. The days are still warm and sunny and there’s still time to enjoy the last remnants of my favorite season. So before we usher in autumn, let’s take a tour of a charming family beach house located in Massachusetts. 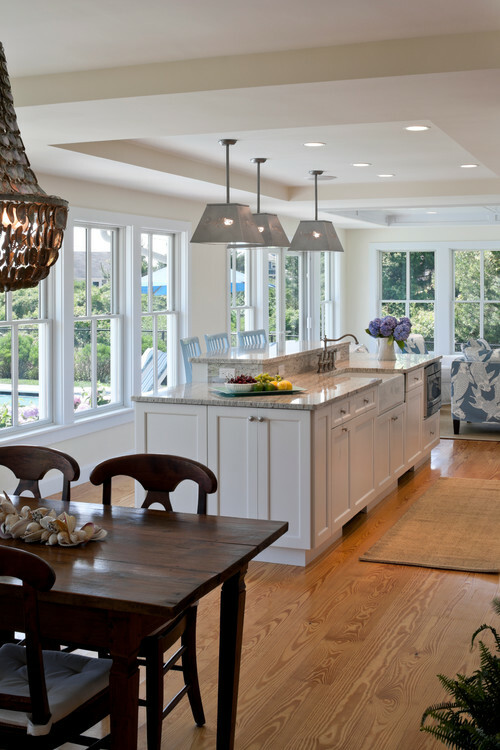 The home is the creation of Polhemus Savery DaSilva Architects Builders. 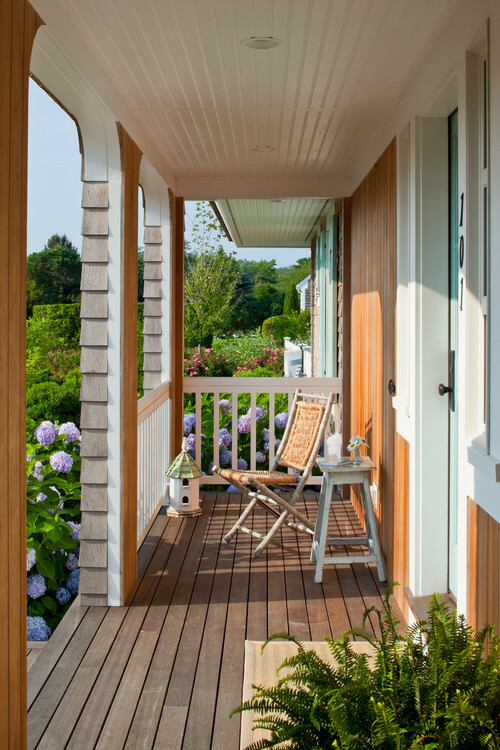 The family beach house is cloaked in classic Nantucket style. 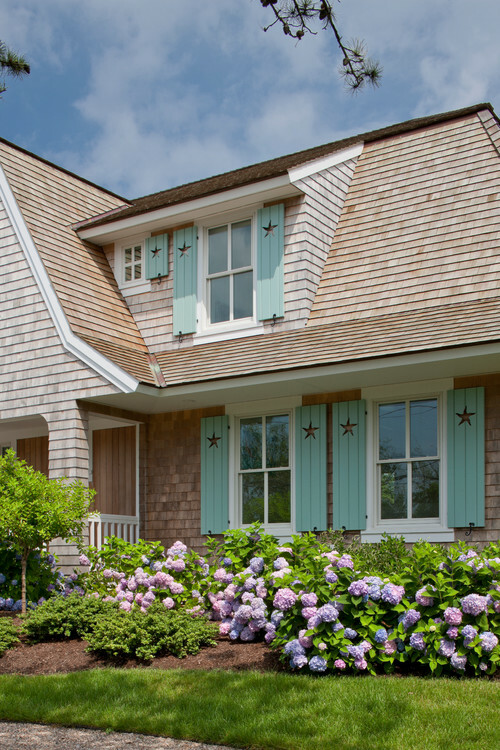 Sea blue shutters feature star cut-outs. 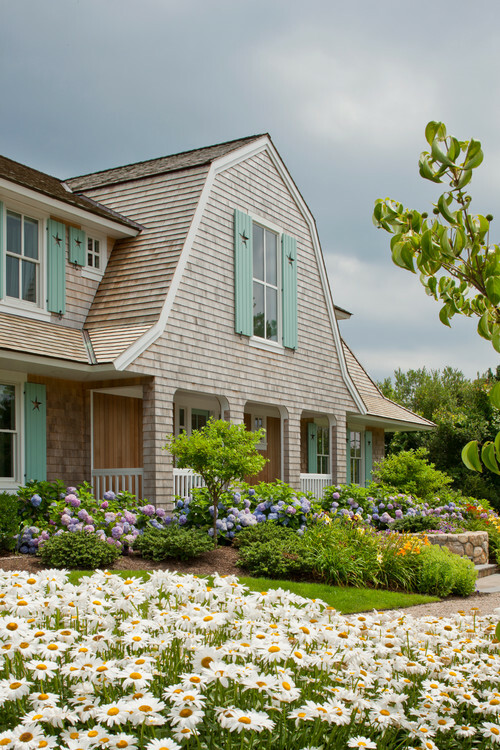 Blue hydrangeas nod their colorful heads on ample bushes, creating cottage-style curb appeal. 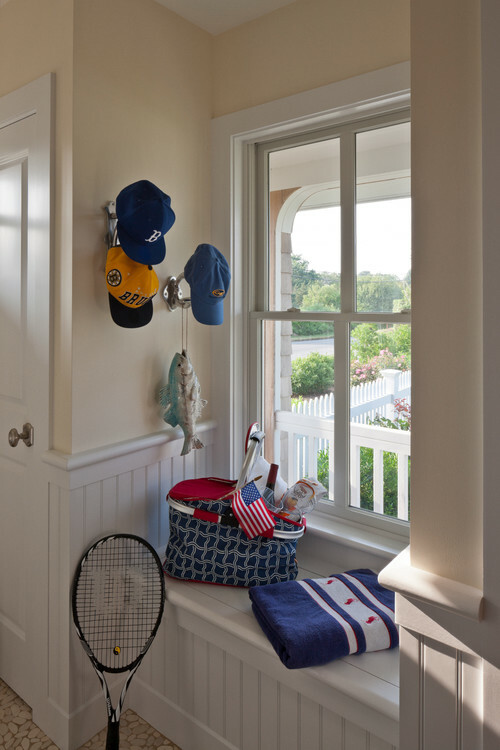 Handy hooks and a small window bench provide a dropping point for hats and outdoor sports paraphernalia. 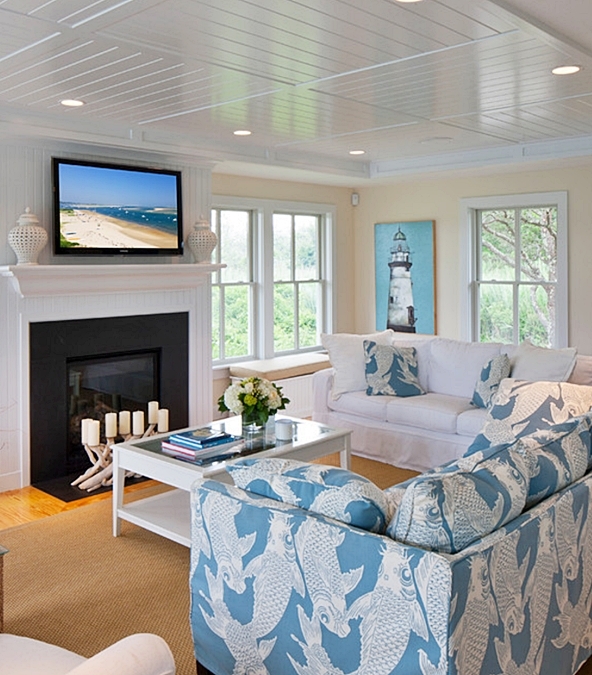 A blue and white living room features beach-style accents throughout the room. 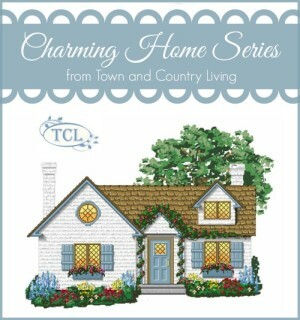 A lighthouse canvas on the wall, a beach scene on the television screen, and a blue and white couch featuring friendly koi. Unadorned windows in the kitchen allow plentiful natural light to fill the room while providing prime views of the beautiful surroundings. 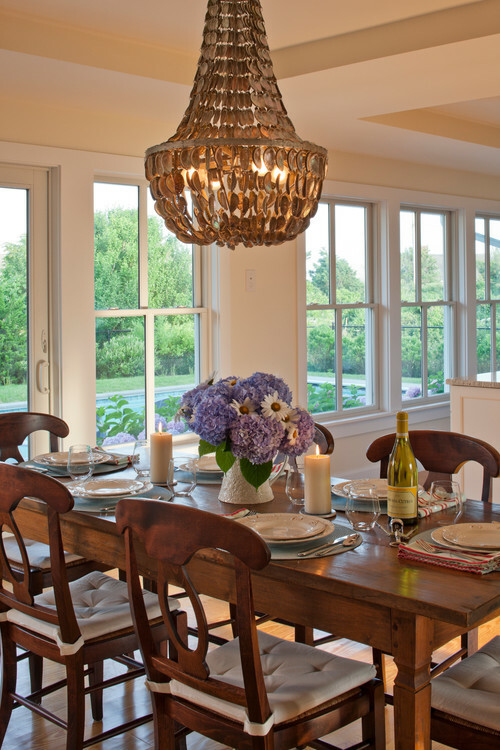 A dramatic seashell chandelier sheds light on the wooden table in the eat-in kitchen. 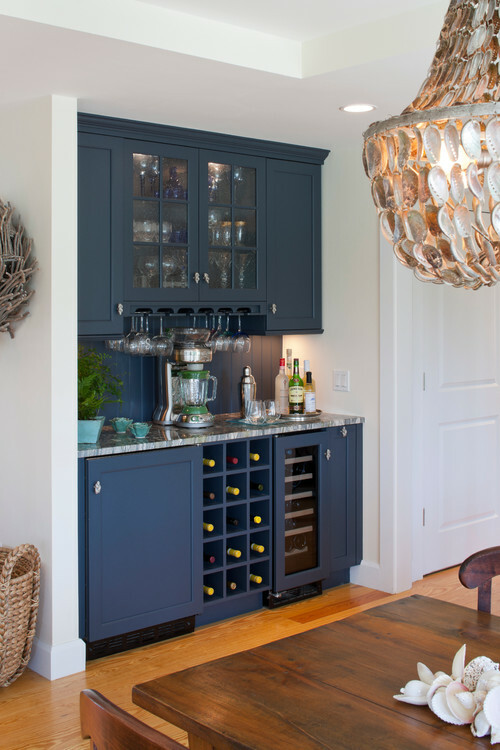 A butler’s pantry painted blue provides a convenient location for serving drinks. 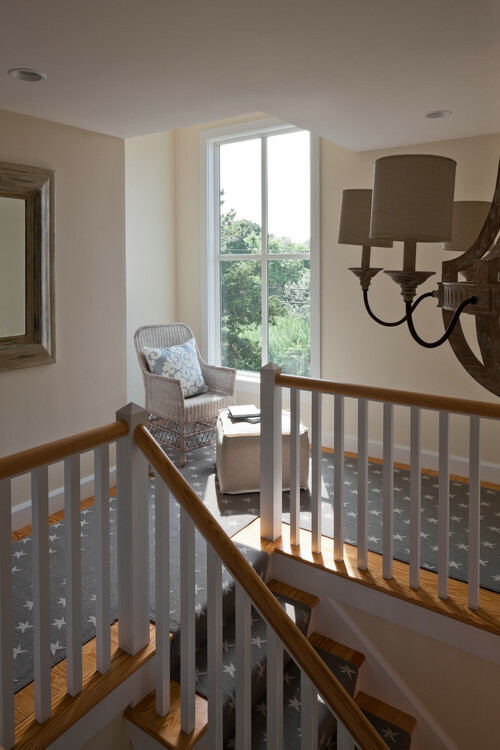 A star-patterned runner up the stairs and in the hallway mimic the starred shutters on the outside of the family beach house. 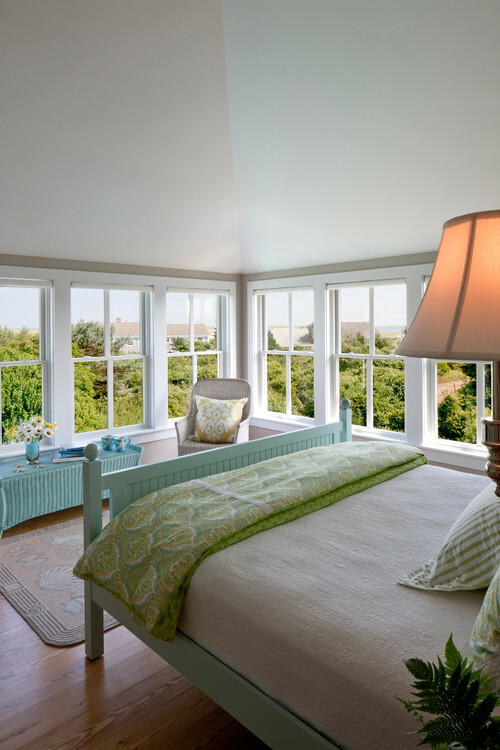 An upstairs bedroom enjoys an expansive and breathtaking view of the surrounding landscape. Pale blue and green reflect the outdoor colors of the trees and sea. Custom cabinetry provides attractive storage for linens or clothing. 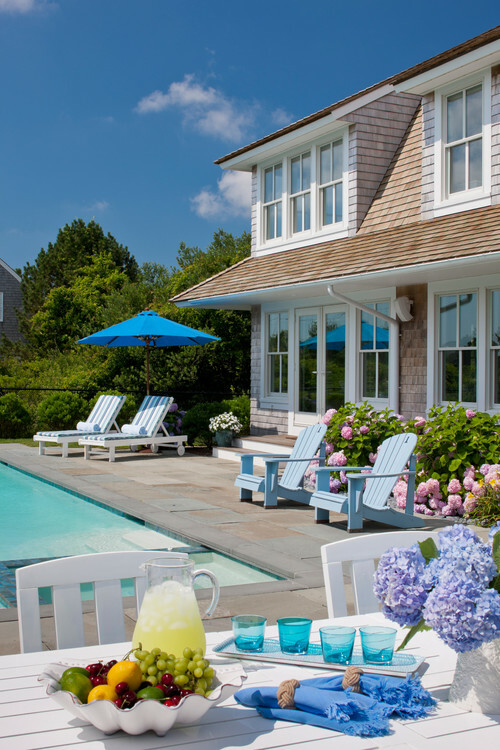 Back outside, you can see the family beach house enjoys seating and entertaining areas around the pool. The same mop-head hydrangeas adorn the back of the home as well as the front. 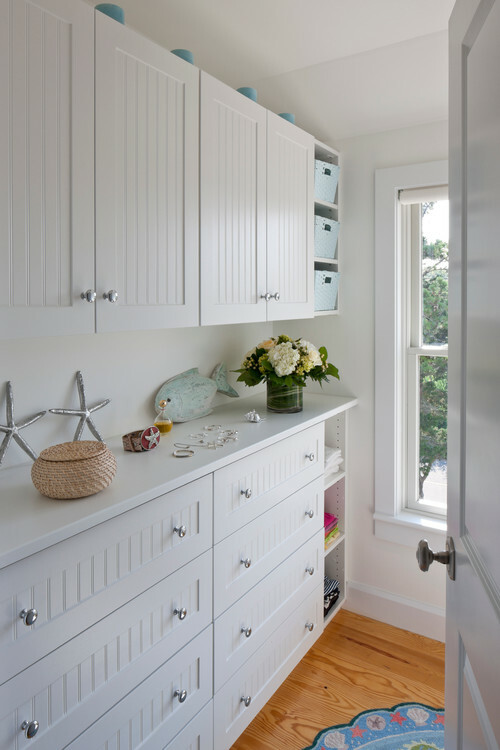 You can see more of today’s family beach house on Houzz. WOW! This is the consummate beach or lake home. Beautiful. I wouldn’t change a thing! Yup, I could live there! Added to my Home Tours board… Happy Sunday! So beautiful. I grew up in Massachusetts and always loved riding by houses like this one. Naturally beautiful. The beach style of architecture is like eating comfort food. Yummy and familiar. So beautiful. I grew up in Massachusetts and always loved riding by houses like this one. Naturally beautiful. To me the beach style of architecture is like eating comfort food. Yummy and familiar. Gorgeous! What else is there to say?! !